Should Ethics and Norms trump Politics and Personalities? The Senate’s consideration of William Barr for Attorney General has brought renewed attention to the legal rules and ethical norms that apply to the recusal of government attorneys and to the independence of law enforcement officials. 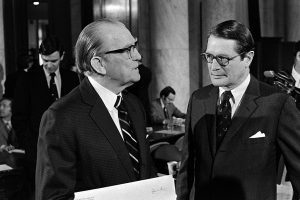 At this time, it is worth revisiting the commitments made by attorneys Elliot Richardson and William Saxbe when they were nominated, successively, by Richard Nixon to be attorney general during the Watergate investigation. Famously, Richardson committed to “pursue the truth wherever it may lead” and to do so “without fear or favor and with regard solely to the public interest.” In other words, legal rules and ethical norms must apply irrespective of the politics of the day or the identity of the President. Should the Attorney General and other government attorneys be asked to go above and beyond statutory requirements and the rules of professional responsibility? How should the Attorney General balance Department of Justice policy and a broader obligation to the public interest? Can we find guidance in other ethical frameworks, such as the Indian concept of dharma, which suggests that when civic and private interests conflict one should prioritize civic responsibilities? Read the original article on Lawfare. ← Is There More to Business Than ‘Shareholder Value’; What Is a Corporation’s Role in Civil Society?